Switching in software on Linux is one of the important parts when using virtualization technologies like KVM or LXC. Typical hosts do not provide one or more physical adapters for each NIC of a virtual machine in KVM or per container when using LXC. Something else must take the part to interconnect the virtual network interfaces. The software switching classical tool is the linuxbridge, which is available in the Linux kernel for a long time. The frontend to manage the linuxbridge is brctl. The newer tool is the Openvswitch (at http://openvswitch.org/). The main frontend is ovs-vsctl. In this post I will show multiple solutions to interconnect Linux namespaces using a software based switch. A performance analysis of these solutions will be discussed in another article later. Starting with network namespaces helps to understand the more complex situations when using KVM or LXC. 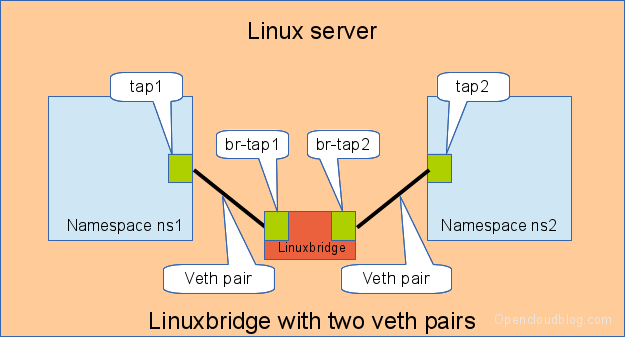 Linux tap interfaces created with ip tuntap cannot be used to attach network namespaces to linuxbridges or the openvswitch. 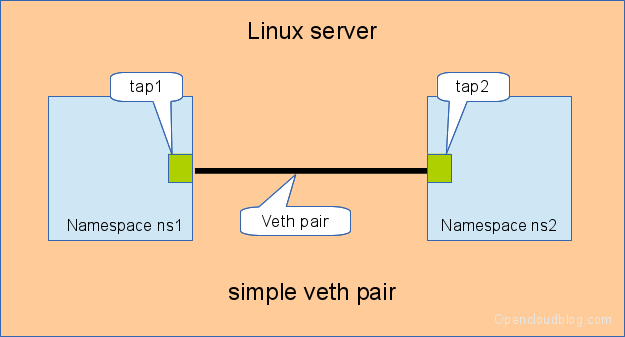 The simple solution to connect two network namespaces is the usage of one veth pair. This has been discussed in a previous artice. When more than two network namespaces (or KVM or LXC instances) must be connected a switch should be used. Linux offers as one solution the well known linux bridge. We need for this setup one switch, and two connectors. In this setup we use a linuxbridge and two veth pairs. Another solution is to use the openvswitch instead of the „old“ linuxbrige. The configuration is nearly the same as for the linuxbridge. We need for this setup one switch, and two connectors. In this setup we use an openvswitch and two veth pairs. Another solution is to use the openvswitch and make use of the openvswitch internal ports. This avoids the usage of the veth pairs, which must be used in all other solutions. We need for this setup one switch, and two connectors. In this setup we use an openvswitch and two openvswitch ports. In another article I will show some performance numbers for the four presented solutions. There are noticeable differences with respect to throughput and CPU usage.